A close encounter with the largest toothed animal on the planet, Giant Sperm Whales. While we still have our sea legs, we continue along on the marine mammal theme and embark on another tour, this time to see the Giant Sperm Whales which the Kaikoura Coast is famous for (also famous for abundant crayfish or NZ Rock Lobster). Whale hunting was a mainstay industry for the Kaikoura District from 1843. The last Sperm Whale to be hunted and caught off the coast of Kaikoura was in 1964. Lucky for the Sperm Whales, the only whale hunting now is done when searching for them for whale watching. We begin our journey from the office of Whale Watch Kaikoura, departing by bus to South Bay where we board the catamaran vessel Aotaki for the speedy trip out to where the sperm whales dwell - over the depths of the Kaikoura Canyon. After around 10-15 minutes of cruising at 25 knots, a crew member spots the telltale bushy spout of a sperm whale and the skipper immediately turns towards the massive bulk. The urgency is all because the whales only stay on the surface for around 5-10 minutes to rest and digest before diving back into the deep dark canyon, and will not reappear for approximately 45 minutes. Apparently, the longest recorded dive of a sperm whale was over 2 hours. We have about five minutes with the first whale which has been named Saddleback, before it returns to the deep. Before slipping away, the whale arches its back then flicks its tail fluke as though to wave goodbye. A crew member then dispatches the hydro-phone to locate the position of another whale. The hydro-phone picks up the clicking of the whale's echolocation and apparently there is one nearby. This time a whale called Manu is resting on the surface however, Manu only spent a few minutes on the surface, and soon arches his back and revealed his tail then slipped away. 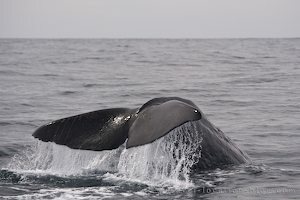 There were a number of sightings of sperm whales including a second sighting of Saddleback (the first whale spotted) during the 3.5 hour tour. The sperm whales congregate along the Kaikoura Coast to feed on the abundant supply of food including giant squid, arrow squid, and various species of fish. Each toothed giant consumes around 300 million tonnes of squid each year - a healthy appetite! The coast here is a feeding ground for Sperm Whales rather than a breeding ground. The sperm whale is preyed on by Orca Whales, although the last successful attack by an Orca on a sperm whale was in 1991. The tour with Whale Watch Kaikoura is comfortable and informative and they even guarantee that you will see a whale, or you receive a refund - you can't lose on that deal!! There are several departures daily and reservations are recommended prior to arrival in Kaikoura if possible, especially in the height of the summer season (January - February). Check out the Whale Watch Kaikoura website for more information. After a morning with the marine mammals of the Kaikoura Coast, we head towards the alpine community of Hanmer Springs passing by lush rolling countryside, cattle, and of course sheep! We arrive in Hanmer Springs and after scouting out the town, we turn our attention to the feature which has made Hanmer popular - the thermal pools. After the photo shoot we couldn't resist a soak ourselves, so swapped the cameras and writing pads for swim suits and tried out the various pools and temperatures.